In an effort to promote sustainable food and more vegan protein options, residence hall cafeterias at Central Michigan University are featuring plant-based burger specials from April 16-20. According to student newspaper Central Michigan Life, all dining halls will “Make the Flip” and offer a specialty vegan black bean burger every day of the week. Burgers are themed according to international flavor profiles. Students can expect unique Greek-style burgers as well as familiar “Corner Diner” American burgers. These limited-time vegan options will be offered at the campus’s American Diner station throughout the week. Indeed, a burger made from plants is a more earth-friendly alternative to a traditional beef burger. In fact, studies have shown that meat production has a greater impact on the environment than the oil industry. The vegan Impossible Burger, for example, uses 74 percent less water and produces 87 percent fewer greenhouse gas emissions than a hamburger. Student Environmental Alliance Vice President Janel Sweeney hopes that the promotion will help diversify the plant-based options offered on campus. “As someone who still eats meat, I think that having different options other than the usual is a great step in appealing to different food preferences,” she said. However, while Students Advocating for Vegetarianism/Veganism President Sarah Merrifield believes that this is a step in the right direction, there is more work to be done to ensure that sustainable food is available all year round. She said that cafeterias have increased vegan offerings, but options for vegan food in Michigan are still limited, making it difficult for students to make commitments to eating plant-based. More consumers than ever are opening up to the idea that protein does not need to come from an animal. 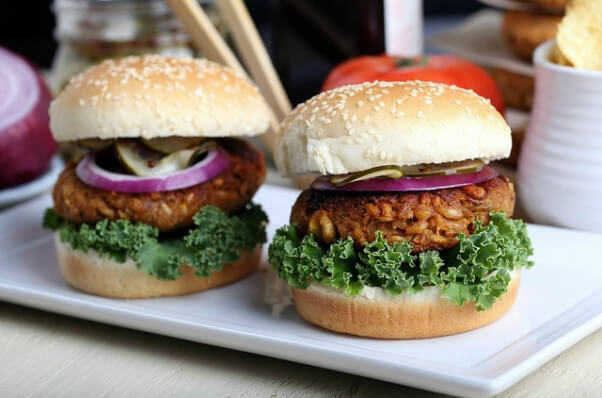 Recent research from global market research firm Mintel shows that 58 percent of Americans are making a conscious effort to replace meat with plant-based protein. Mintel also reports that 52 percent of Americans actually prefer the taste of vegan protein over meat. Finally, according to a new report from GlobalData, 72 percent of the world population is reducing or leaving meat off their plates altogether.